Waterfalls are lovely to watch and listen to, and few ponds or water gardens are complete without them. However, they are not infallible, and are subject to problems that you’ll occasionally have to resolve. Here are some common waterfall challenges you’ll encounter as a pond owner and how to solve them. Waterfalls are notorious for water loss, and while it can be a nuisance, it can be resolved with a small amount of maintenance. The first thing you’ll want to do is purchase the waterfall box. They are affordable, and will do an outstanding job of ensuring the pump line has a connection that is leak free and which won’t malfunction. Additionally, it simplifies the filtration process and makes it a breeze to install the waterfall, since the feeder area is usually the most challenging part of it. Many pond owners are lackadaisical when it comes to installing a liner; don’t be. Positioning a quality liner base beneath the rocks that continues along the waterfall length and stream edges will capture the water that will leak through the stonework, sending it down into the pond. Liner installation will also prevent many of the leakage problems which are common in ponds that don’t have them. Every waterfall splashes, some more than others. If you feel that it is getting out of hand, you will need to perform some maintenance, but getting things right in the initial design is the best solution. A professional pond designer will be able to determine in advance where splashing will likely be heaviest, and will compensate for it, constructing the pond in a manner where the water is contained, either moving further into the waterfall or pond. This is important for water conservation, among other things. If you’re experiencing splashing on an existing pond, the waterfall itself can be calibrated through the positioning of rocks nearby. 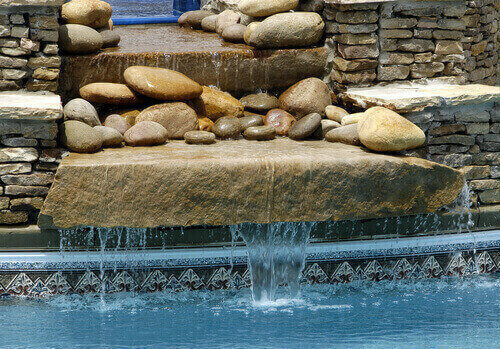 This will allow you to control the waterfall and the direction in which its water flows, while also giving it a natural look. Plants which border a waterfall are beautiful and will complement it, but can sometimes be a cause of water loss. This is often due to the plant tendrils, which may grow inside the watercourse where it will then absorb a considerable amount of water. If you suddenly notice that your waterfall is losing a lot of water, it may not be due to a leak, but the plants which border it. The simplest solution to the problem is to trim the plant tendrils so that they don’t interfere with or absorb the water flow. Ponds which employ waterfalls must also use the correct pump. You have to think about the watercourse elevation gain, and since it takes more effort for the pump to push water uphill, the GPH, or gallons per hour may differ based on elevation.